​In 1956 this new landmark of the town replaced “The Madonna del Mare'' (22**) that had been torn down by the sea. The seagulls are very fond of their girl and enjoy perching on her head & arms. Whatever your interest may be there is something for every curious mind and adventurous (or not so adventurous) heart. Set sail from Opatija Harbor and travel to the many picturesque neighboring islands. And for you honeymooners out there don't forget to visit the island Rab, known in Croatia as the island of love! If you prefer a more leisurely afternoon how about exploring one of the many foot paths hidden along the back hills of Opatija. With kiwi and lemon trees lining just one of the many secluded and scenic cobblestone walkways it's no wonder that the locals care to keep these tucked away trails a bit of a mystery. Built in phases, this path stretches from Preluka to Lovran and its total length is approximately 12 kilometers. The initiator of the operation was the Scenic Improvement Society (Abbazianer Verschönerungsverein), and the conductors of the works were Heinrich Gintl, Alfred Manussi and Konrad Rubbia. They were confronted with great land Lungomare (Seaside Promenade) purchasing problems and countless disputes had to be settled through the authority of Jettmar, the county captain. The first, northern phase of the path (Volosko-Slatina) was completed in 1889, when Opatija officially becomes a Health Resort (the stretch from Dražice to the port was finished around 1888), and the southernmost section (that connected Opatija with the promenade in Lovran) only around 1911, thanks to the commitment of physician Julius Hortenau. Planned as an important trump card for health tourism, this path, together with the parallel woodland path in the town’s hinterland (today’s Carmen Sylva Promenade) is a potential of psycho physical recreation that is indeed insufficiently exploited. 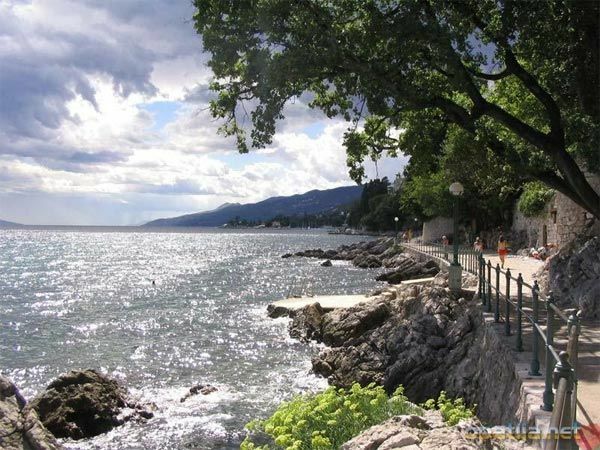 In addition to this, the Promenade passes by most of the significant structures of Opatija’s history, linking the old sanatoriums of the North Strand, the port, Lido, villas Angiolina and Amalia, hotel Kvarner, St. Jacob’s church and finally the hotels with the villas of the South Strand. One of the highest points above sea level is the Grotta del Diavolo (Teufelsbrunnen) near the residence of the consul of Venezuela. Some features of the seaside promenade have been lost: the bust in honor of Admiral Littrow on the North Strand is gone, the Dr. Masarei footbridge has disappeared – replaced by the reconstructed path in front of hotel Admiral. Again, there are points that have changed only, in appearance, location or through use: Schwerdtner’s relievo of Billroth made in 1907, with the inscription Dem großen Arzt und Förderer des Kurortes (“To a great physician and promoter of the health resort”), was destroyed in World War II, and Dolinar’s new one, with the inscription “An outstanding surgeon and a friend of Opatija,” was erected in 1965 several meters further to the south, on the chapel wall. Rathausky’s bust of Schüler (Rathausky is also the sculptor of the Helios and Selene fountain in front of the Imperial and of the Madonna del Mare, now located in front of St. Jacob’s church) once stood on the seaside promenade in front of hotel Kvarner, and today it stands in the Angiolina Park (ex 1. maja) among the bananas. Finally, there are newly erected symbols, such as the memorial tablet to Pilsudski in the Sv. Jakov Park, not far from the Maiden with a seagull. For centuries this area was dotted with wooden tuna lookouts reached only by by ladders, while fishing nets, like giant spiders' webs, were scattered to dry along the sea shore. The deserted quarry here once supplied material for the construction of Rijeka's Korzo promenade. Today this bay is a particular favorite among sailors and windsurfers who make full use of the ideal winds that blow in the area, especially the nightly tramontana in the autumn. In the 18th century this tranquil fishing village used to be an important shipping center called the 1884 Rijeka-Volosko-Opatija steamship line. It was also used for shipbuilding and trade, but later it lost out to Rijeka and Opatija. In the house next to the Amfora restaurant the Hungarian count Gyula Andrássy spent the last days of his life as a political rebel and advocate for the Dual Monarchy. It has been rumored that the empress Elisabeth paid him three unofficial visits here - were the two of them really lovers? The sea cartographer, lyricist, dramatist and captain Heinrich von Littrow spread news about the qualities of the Opatija Riviera in countless publications, created a valuable relief of the Adriatic, was an Austrian Lloyd's seaman, founder of the Opatija Yacht Club & lived in the town until his death. In 2006 the Holleis family donated this plaque to replace the bust destroyed during the war. The first owner, biologist baron Eugen Ransonnet-Villez invented a bell for underwater painting, discovered the Blue Cave on the island of Biševo in Dalmatia, and planted bamboo in the park between the villa and the promenade. A later owner, Consul Leo Kremesek, supposedly lost his private parts here in a fight with his maid because although he loved the lady, he did not want to marry her. This is where the Czech violinist Jan Kubelik used to live, a man whose genius has sometimes been compared to Paganini’s. Kubelik had soundproofed insulation installed in the house so he could play music at the same time with his children. Built between 1890 and 1897 for a certain Mr. Meyne from Burgenland and later owned by the countess Laura Henckel-Donnersmark, this villa gained more and more similarities with Archduke Ferdinand Max's dream palace of Miramar in Trieste. It became a favorite destination of many prominent guests who wanted to stay in a central location yet away from the crowd. Vladimir Nabokov spent a summer of his childhood here, and Ludwig Salvator, Archduke of Tuscany, paid several visits here too. Once the “New Sanatorium Schalk'' was founded here by Franz Schalk from Styria. At a later date the sanatorium was named Lakatós. During a cure in Opatija, this Polish writer wrote the short story “Bullfight'' (which was the basis for the roman “Quo Vadis”). He also began his novel “Mr Wolodyjowski'' In 1905 he won the Nobel Prize for literature. The bust of Friedrich Schiller was put up to the memory of this Austrian railway expert, pioneer of tourism and general director of the Austrian Southern Railway who played a decisive role in promoting, financing and creating the Austrian Riviera from 1882. Without him, Opatija would not be what it is today. This location was once planned as a sight to build a huge health palace with ballrooms, concert halls, artificial wave pools, cafés and shops, but this mega-project failed due to World War One. Today you will find an Open Air Theatre in its place that hosts numerous films, concerts and other cultural events every summer. Living on the edge of poverty, music teacher and composer (Ivan Matetić Ronjgov dedicated his life to the musical heritage of Istria and Kvarner. Villa Angiolina is “the cradle of Opatija's tourism”. It all a began in 1844 when a merchant from Rijeka, Iginio Scarpa, bought this peninsula in 1844 at a very low price, turned a humble house into a splendid villa, named it after his late wife and began inviting his noted friends to visit him. This resulted in ever more prominent personalities visiting Opatija, like the Austrian empress Maria Anna who paid a visit here in 1860. After that the plot was sold in 1911 to the Health Commission for as much as 2.5 million Guldens. Today the villa hosts newly opened Museum of tourism. Since 1885 over 150 species of plants from all over the world have successfully put down roots here: sequoias, lemon trees, Caucasian fir, Spanish box tree, bougainvillea, Japanese bananas and black bamboo. There is a legend that the camellia, since 1974 - the symbol of Opatija, was first smuggled from the Philippines to Europe by a Jesuit monk named Camelus. Constructed in 1890 as an annex to the Hotel Quarnero for the “wealthy clientele'', which included the German imperial family and the famous American dancer Isadora Duncan. Duncan was here inspired by the fluttering palm tree to create her own dance movements (you find a sculpture outside the building (work of Opatija's sculptress Tatjana Kostanjevic). The Angiolinabad used to be one of the most popular swimming baths in Opatija. The first swimming tourists used to enter the water fully dressed and would sometimes tie themselves to one of the posts so they wouldn’t drown. Unfortunately, the pretty wooden Jugendstil building does not exist anymore. Most likely the oldest hotel on the eastern Adriatic coast was constructed in 1884 as the first luxury destination in Opatija. Originally it was a lung disease sanatorium for nobility and prominent people, but after the thermal baths were destroyed in a fire, the Crystal Hall was built instead - a magnificent new ballroom and a concert hall. The internationally renewed surgeon Theodor Billroth praised the advantages of the health resort in letters to his colleagues and dissertations like no one else. On one of his frequent visits to Opatija he died here in 1894. The inscription on the plaque reads: “Great surgeon, friend of Opatija''. The monastery that was built around 1420 by the Benedictines is the origin of the town to which it gets the name (“Opatija” means “abbey” in Croatian). After being only building on a large piece of land for quite a long time, it was reconstructed so many times that has little left of its original appearance. A tiny niche in the interior hosts a replica of “Pieta” by the famous Croatian sculptor Ivan Meštrović. The original of this gilded replica was originally located where today stands the famous “Girl with the Seagull'', watched over the souls of count Kesselstatt and countess Fries who had drowned in 1891 close to this promontory. Today an exhibition space, it used to be the famous Café Glacier which had fresh cakes delivered by express train from Vienna and Budapest. Hasslinger, Al Mare, Hausner, Park, Jadran and Millennium. The Café Wagner on the ground floor his been very popular ever since it was first opened in 1898. The large terrace offers a splendid sea view. In 1956 this new landmark of the town replaced “The Madonna del Mare'' (22) that had been torn down by the sea. The seagulls are very fond of their girl and enjoy perching on her head&arms. Built in 1885 as the second hotel in Opatija, named after the crown princess Stephanie “Hotel Kronprinzessin Stephanie”, this hotel offered all the luxury of the era: healing baths, health treatments and large aquarium. James Joyce appreciated it very much. At the time of its construction, this hotel closely resembled the neighboring Villa Opatija. Built from 1906 to1908 in neo-Baroque and Art Nouveau style, this hotel accommodated the heir to the throne Franz Ferdinand and the grand-daughter of the emperor Franz Josef. Josef Grusser built the hotel "Bellevue", and his son built hotel "Palace". The corridor connects Palace with the neighboring Hotel Bellevue (built in 1891). Since 2002, this inspiring property full of stories and anecdotes hosts the casino “Admiral Opatija”. There are rumors that (built in 1891) once the Villa was a secret meeting place of the emperor Franz Josef and the actress Katharine Schratt. Stylish rooms preserved their fashionable air up to the present day. The neighboring Hotel Kristal was for a period of time owned by the great Austrian actress Tilla Durieux. This is place where the Viennese doctor and balneologist Julius Glax used to live, now regarded as the most significant inhabitant of Opatija and father of the health tourism in the area. He was the first director of the Health Commission, devoted to Opatija until his death in 1922. Julius Glax's daughter had this villa constructed around 1908. During Opatija's Italian era, the prince Andrea Boncompagni had the villa equipped with a modern ventilation system and central heating. 33. “The Devil's Well'' or Grotta del Diabolo in Punta Kolova. During storms, dreadful sounds come through this rock cleft right at the point where the promenade is at its highest above sea-level. This Jugendstil villa, one of the most attractive on the Liburnian coast, was built by the Austrian Architect Ludwig Münz in 1903. (Münz introduced the tram system in Opatija). As tiny as this holiday resort town may appear today, it was an important harbor for loading wood for the village of Veprinac during the middle Ages. Later on the large Jesuit estate and a baroque monastery were built here. The mid-19th century was the end of Ika as an important shipyard. Instead of shipbuilding, Friedrich Schüller developed the vine production, fruit and vegetables cultivation in order to supply the first two hotels in Opatija. The personal style of the Austrian architect Karl Seidl dominates the local architecture. In consideration of local conditions and the available material of the buildings, and with a weakness for romanticism, he created several buildings and oversaw several rebuilding in Opatija and Lovran. The neighboring villas of Santa Maria and Magnolia are also his works. The Frappart is regarded as the most beautiful noble residence on the Opatija Riviera. It was built by Michael Ruault-Frappart in 1900. His father was famous dancer, mimic and choreographer at the Vienna State Opera. Nicolo Guerra ordered this villa in Venetian Flower Gothic style at a time when hardly one Italian lived on the Austro-Hungarian Riviera, but his wife Camilla was a dancer at the Vienna Opera. Today this villa is an exquisite mini-hotel and restaurant. The port town of Lovran is one of the oldest settlements on the Opatija Riviera. It dates back to the 7th century and boasts numerous historic villas, parks and an interesting old town. Lovran and hinterland are the venue for great gastronomic events: “Days of cherries” in June, “Marunada”- festival of local sweet chestnuts in the autumn.